Not so many people know of Kaboo Casino, but it’s one of the new players in the online casino and gambling industry. The site was launched in 2015 by Betit Operations Ltd, a company that has a reputation for running a number of top rated online casinos in Europe. This includes the likes of High Roller Casino, Thrills Casino and the famous Super Lenny Casino – one that introduced a fictional character, Mr Super Lenny. We have prepared an in-depth Kaboo Casino review for you, stay tuned. Players at Kaboo Casino can play knowing that the brand is licensed to offer United Kingdom and European players at large safe and regulated services using the UK Gambling Commission and Malta Gaming Authority licenses. During the casino’s short stay online, Kaboo has gained a reputation for fair gaming, fast and reliable payouts, a well-decorated game portfolio and most importantly, unique promotions that are run more often. These factors have seen this site gain hundreds of thousands of avid players from all the corners of Europe. Currently, Kaboo Casino is marketed at European, UK and Australian players and hits the nail on the head on all its offerings. If you are curious to know more about this site, we highly suggest that you continue reading out detailed and unbiased Kaboo Casino review. Having tried and tested the services offered at Kaboo Casino, we can comfortably say that the site has one main objective; to leave a trail of gaming brilliance and they want to tag you along on the ride. The site is excited to offer us the best in online casino gaming, and they shout about their offers right from the moment you land on their home page. They even have an exclamation mark on their ‘Relic Road Trip!’ offer for Christ’s sake! Malta is where Kaboo’s epic road trip begun, but now the casino is all over Europe. Players like the casinos and they like their players back evident by the number of games they have to offer; their effective customer service delivery and their efforts to being on the front line to bring only the latest offerings in the industry. Kaboo Casino has opted to use what we’d refer to as a ‘potent combination’ of Microgaming, NetEnt, IGT, Push Gaming, Quickspin, Red Tiger, Betsoft, Play ‘n Go and Pragmatic Play software to power it’s site’s current game portfolio. This diversity offers a relatively large number of games for you to choose from. Since the site was launched three years ago, their main focus has been on offering video slot games before they gradually started increasing other casino games for players to choose. At the time of writing this Kaboo Casino Review, there are 816 games on offer, with slots constituting of 669; table games comprising of 68 games; live casino games contributing 58 games; while jackpot and classic slots constituting of the list number at 17 and 12 games respectively. There’s even a special category of games referred to as K.A.R.E.N Loves, which is made up a mixture of all these games and constitutes of 17 games, with our favourite game from the list being IGTs Electric Tiger Slot. It’s an awesome game with high returns and bonus rounds that pop up from time to time. Microgaming and NetEnt continue to show why they are usually rated as some of the top software providers with the two companies providing almost 50% of Kaboo’s slots. If you are a big fan of Microgaming and NetEnt slots, then we don’t need to tell you what to do. It’s pretty obvious that you should visit the site, where you can play most of these games for free, no download required before you can start betting using real cash. In this section, we won’t focus on talking about slots anymore in lines of how many games are offered at the site. Instead, we’d like to talk about how easy these games are to play and how they compare to what other sites have to offer. First, there are all sorts of video slot games that you’d like to think of. Classic reel fruit slot, vintage styled games, contemporary video slots, 3D slots or jackpot slots, all of them you’ll find in the casino’s game portfolio. Nearly all the companies offer video slot games with high-quality graphics, but if you really want to have an immersive 3D gaming experience, then we highly recommend Betsoft slots. Those games are few because of a reason; Kaboo seems to have handpicked only the best from the company’s game portfolio to offer. These games have been designed to thrill just as they are pleasing to look at. Secondly, if you are fond of playing mobile slot games, then you should try playing NetEnt slots. Majority of the games offered at the site use the company’s NetEnt One Touch feature, which makes it easy to play the game on your mobile device. Lastly, there are those of you who love jackpot slots. But did you know that Red Tiger slots have daily, weekly or monthly jackpots that have to pay out accordingly? If you want to try out your luck in massive wins, we highly recommend that you try games from this company. They are equally as thrilling too as they are rewarding! 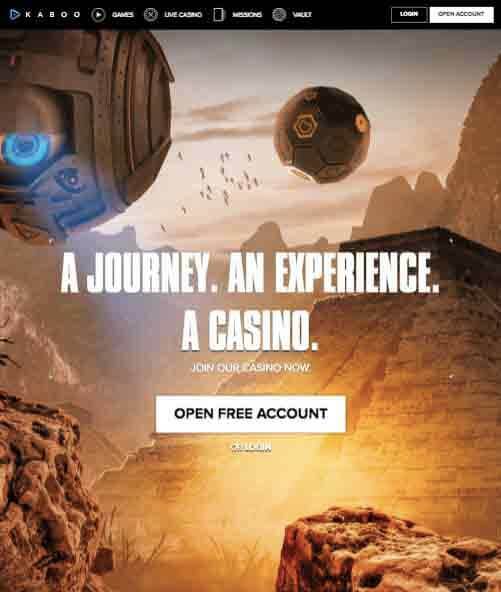 Kaboo Casino isn’t your typical online casino platform, and this is evident by the approach that they’ve taken on their bonus and promotion system. To welcome new casino players, the site offers you a not so lucrative welcome bonus of 100% match deposit up to a maximum of £50. We’ve used the term not so lucrative because other websites have the bonus capped at highs of £100, £500 or even £1,000. However, the beauty with this bonus is that it’s easy to claim and it’s automatically credited to your account once you’ve met the wagering requirements as indicated in the bonus terms. Besides the welcome bonus offer, there’s now the very unique Relics and Missions promotions. Below is a breakdown of what these two promotions are all about. 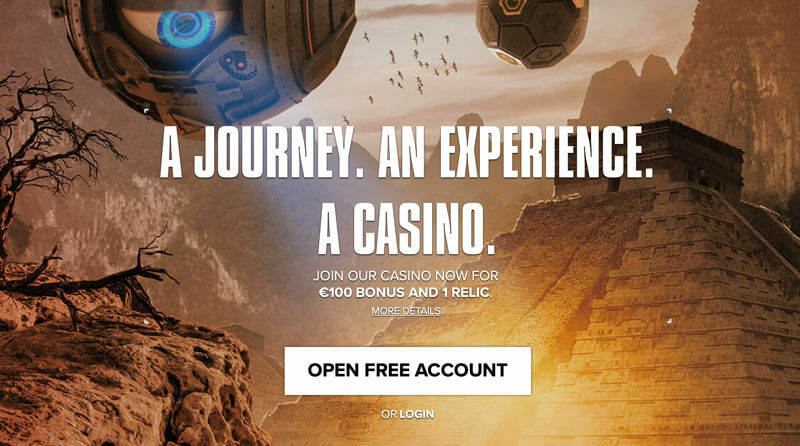 Kaboo Casino Relics: Relics are long lost artefacts that have some value, and Kaboo Casino offers you an opportunity to win some cash prizes, free spins and bonuses by earning relics. In order to do this, you have to spend real money playing the games offered at the site. Each dollar or pound spent at the site will earn you a point and the more points you accumulate, the higher you advance up the levels. Once you reach the target, you’ll be rewarded with a relic box that contains either cash prize, bonus money or free spins. The best that you can get from a relic is the jackpot prize, which you can earn by triggering either the Chaos Relics or Carbon Relics. The Chaos Relics has a £5,000 prize, while the Carbon Relics has a £1,000 prize attached to it. You can also earn yourself relics and other cash/bonuses through Kaboo Casino’s Relic Road Trip promotion. This one constitutes of tournaments and missions, which have hidden surprises for you to unravel. Once you decide to go mobile with Kaboo Casino, you’ll notice that everything on the site runs pretty much the same way as the desktop site. As you’ll be scrolling down the home page, you’ll notice that all the important features have been highlighted on the first page. The first section constitutes of the call to action button, which lets you open an account for free; the second section has a list of all the games offered at the casino, you can try them for free by clicking on the ‘try games’ button, and the last section is the missions section. At the top of the Kaboo mobile page, right next to the casino name Kaboo, there’s the menu section. Clicking it will reveal a number of features including ‘Games’, ‘Live Casino’, ‘Missions’ and the ‘Vault’ section. These buttons have been strategically placed so that you can have easy access to various services offered at the casino. So, does Kaboo Casino have a mobile application or is it a fully no download platform? And how did it fair on in terms of performance? Let’s have a quick look. This will come as sad news to all the players who enjoy playing their games straight from the casino’s mobile app, but Kaboo Casino doesn’t have any mobile application. Instead, they opted to use the no download approach, which gives players direct access to the site through their device’s browser. This makes it much easier for players to start playing on the go. As already mentioned, you can access Kaboo Casino through your device’s browser. This makes it very easy for you to start playing on the move without any hassle. As far as user experience is concerned, we did like the neat arrangement of the mobile site. All the important buttons are visibly marked, so you won’t find it difficult to locate whatever service you are looking for. The games are also neatly arranged in tiles, categorized into different software providers, which further makes it easy to navigate the site. In fact, if you take a closer look at the mobile casino and compare it to the PC/Laptop site, you’ll realize that it’s a 100% replica of the site. Sometimes, the mobile devices that you might be using might have small screens so if you wish to have a full experience; it’s highly recommended that you use the landscape format instead of the portrait or you use an iPad or Tablet in place of your usual smartphone. 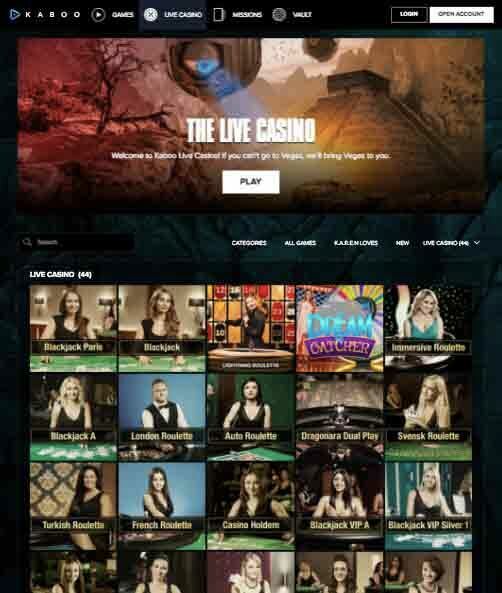 Kaboo Live Casino seeks to offer its members with an immersive live experience, which they hope will compete with some of the other top online casino websites. We must commend them for the effort they put into designing the live casino lobby, which boasts coolness in both content and style. This should revitalize bettors looking for something fresh to play. For its live casino offerings, Kaboo Casino has decided to partner with NetEnt. NetEnt is a renowned software company in the industry, though their live casino games aren’t as good as those developed by Evolution Gaming. Nonetheless, the games are fine, the bet limits compete fairly with those of Evolution Gaming, and the video stream quality is okay. Kaboo’s live casino gaming is beamed straight to your device’s screen in stunning HD. As we’ve mentioned already, there are a number of options that you can choose from the neatly arranged live casino lobby. Once you select the game of your liking, you’ll be transported straight to the table of your choice, where you’ll find a presentable, professional and jovial live dealer waiting for you. One thing that you’ll notice is that the dealer’s share some of these studios, so as you’ll be playing one game, there are chances that you’ll see other dealers in the background offering services to other players. While some might complain about this, we believe that NetEnt chooses this approach to add to the ‘real land-based’ casino atmosphere. We liked how you can customize your screen through the NetEnt live casino engine. This will enable you to select how you’d like the game to appear on the screen, how the table information should be included on the screen among many others. There’s also a feature which lets you chat with some of the players seated at the table, just as you would at the land-based casino. However, we recommend that you be wary of scammers as some of these tables are filled with them. One thing that you have to give it up to Kaboo is the effort that they have put to ensure that the games run smoothly on both PC and mobile platforms. If you are leaving your office and don’t want to leave your blackjack table, you can easily log into your account, using your mobile device and still get to enjoy the same quality of graphics and display on the mobile. As we mentioned above, you only need to ensure that your device is in landscape mode to get the best experience. As we wrap us this section, we’d like to mention that live casino games offered at Kaboo Casino aren’t for free. Due to the costs implications – especially for maintaining the studios and paying the croupiers serving you – you have to wager real money to enjoy the service. Bet limits start from a low of £1.00 up to a maximum of £5,000 or so. The higher limit we aren’t quite sure, but for the few blackjack games that we asked about, we were told £5,000 is the highest bet amount. As a European online casino, Kaboo Casino has a wide variety of payment and withdrawal options that service its European clientele accordingly. The casino’s banking options are readily available in multiple countries all over Europe and can handle payments promptly. There are shortcomings to these methods though. You are limited to withdrawing your cash using the same method that you used to deposit with. This means if you made a deposit while in the UK and travel say to Sweden where your payment option is not supported, you’ll have to wait until you are back to the UK to access your funds. This causes unnecessary inconveniences. Supported banking options at Kaboo Casino include Skrill, Neteller, MasterCard, VISA Electron, Paysafecard, Trustly, VISA, Zimpler, Euteller and Bank Wire Transfer. All these options can be used to make both deposits and withdrawals. There are no fees imposed on both deposits and withdrawals. We give Kaboo Casino a big thumbs up for this as some of the other online casinos impose fees on players, which we think isn’t fair. This information isn’t quite clear on the website, especially when it comes to the maximum amount that you can withdraw. However, we are sure that you can only withdraw a minimum of £20, as indicated on the site’s website. There’s also vague information pertaining the maximum amount that players can make. However, we tried making a £30,000 deposit, and it was accepted. The minimum amount that you can, however, deposit at the casino is set at £10. At Kaboo Casino, they are always working round the clock to ensure that things are running as smooth as possible. That’s why they have multiple channels through which you can contact them. If you’ve gone through the site’s FAQs page and still haven’t found the solution to your problem, then you can contact the customer support team through any one of the following channels. When sending your email address, it’s important that you use the email linked to your casino account to give the customer support team an easy time when serving you. Kaboo Casino runs its day to day activities using a license issued by the UK Gambling Commission as well as the Maltese Gambling Authority. A quick look at the site will also reveal that the site is also reviewed by independent third-party companies to certify that it’s indeed safe and secure to offer online casino related services. Kaboo Casino was launched in 2015, and it’s operated with Betit Operations Ltd. It has also partnered with top software providers in the industry as indicated in the review as well as internationally renowned online banking companies just to ensure that you are entertained enough and that all your money is safely and securely kept at all times. To ensure that you are always safeguarded at all times from external attacks to the casino, Kaboo uses the latest SSL encryption technology. It always ensures that all your sessions at the site are encrypted using the best possible means. This encryption works together with the firewall technology, which keeps all your financial and personal information intact. Fair Play is the base where Kaboo Casino is standing on. Every game at the site is unique and encrypted using the same technology that keeps you safe from external attacks. Every time you wager real money at the casino, Kaboo’s system will use Random Number Generators to randomize the game’s results and make them totally unpredictable. The encryption technology ensures that no one can alter the results from either side, thus ensuring accurate results. For accountability purposes, Kaboo Casino has made it possible for you to view your Banking History logs as well as your Game History. All you have to do is click on the ‘History’ button to reveal a list of all your activities at the casino, including how much you’ve wagered, which games you’ve been playing as well as the game’s results. As for the Banking History, you’ll be able to see the much that you’ve deposited and cashed out. As promised, here are our final thoughts after our Kaboo Casino review. Kaboo is an online casino platform that’s trying to dig its teeth deep into an already competitive market. Having been founded in 2015, it means that they are more than a decade behind some of the industry leaders in terms of reputation and experience. However, we’ve liked how the team behind it have done plenty of things right especially when it comes to the gaming options, the number of promotions and most importantly, the service delivery. Beyond this, they also offer you nice touches such as the reality check gambling feature, which ensures safe casino gaming. Overall, we believe that Kaboo has a potential to become one of the best in the industry!